Any illustrious gamer or video game collector knows finding the right storage is as important as finding and playing the games themselves. These world-building, interactive adventures packed inside of a single disc deserve better than to be stowed haphazardly inside cardboard boxes under your bed, where they may risk getting damaged or being forgotten. And besides, there’s always that inherent satisfaction when we see our favorite games in display in their original cases with the original display art, lined up in shelves or cupboards that make organization much, much easier. So what kind of storage units should you be considering for your video games? Here are our top picks. 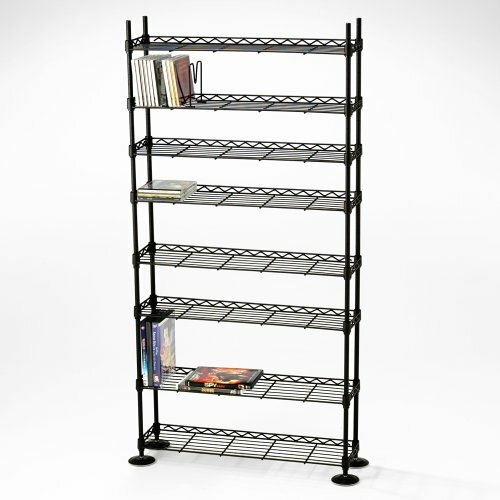 Minimalistic but chic, this multi-tiered shelf rack is specifically designed to accommodate and display multimedia, be it your music CDs, Blu-rays, or, of course, video games. 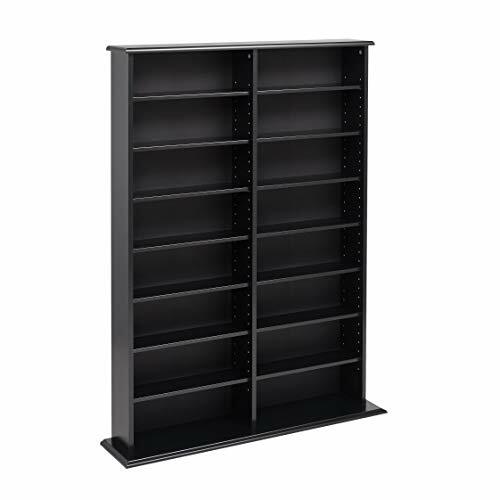 With a lightweight but sturdy steel frame, this shelf capitalizes on height rather than width, letting you pack anywhere between 150 to 450 game cases – depending on the size you pick – while taking up little floor or wall space. The shelves come with adjustable organizers, which work a little like bookends, letting you partition off levels of the shelf to store different types of media, for instance separating video games by genre or choosing to store your movie Blu-rays in the same place. You get a combination of tiers roomy enough to let you snugly fit in and display CDs, single cases, box-sets and even decorative items to give the shelf a bit more personality and a homely touch. Available in both black and silver, the shelf is available in 5, 8 and 12 tiers. 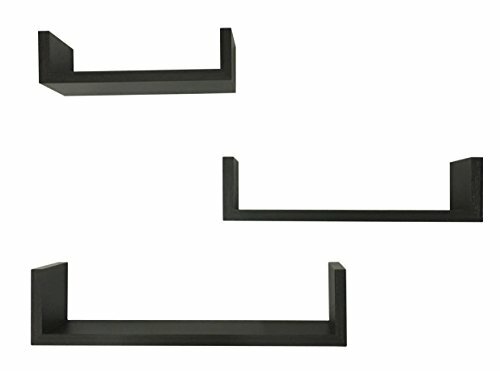 Available in a set of three, and in two minimalistic but classy colors – you can choose between a dark, espresso finish or a snowy white – these shelves are ideal if you have just a couple of game cases you wish to display, want to have more of an aesthetic display with several of these sets, or simply want to give a couple of your video games a place of honor away from your main storage unit. These ‘floating’ shelves are constructed out of medium-density fiberboard (MDF) and laminate, to make them both sturdy and durable, and come in three size options, for small, medium, and large. Installation is simple, requiring you to insert drywall anchors into the walls you wish to hang these on, and then using these anchors to hold the screws you’ll need to fasten the shelves up. It’s a handy tip to have your own drywall anchors, as the ones included with the packaging may not be sturdy enough to hold up, but this is an inexpensive swap-out for shelves which are otherwise as perfect as storage units as they are aesthetically attractive. If you need a heavy capacity storage unit but are worried about the space this may take up, look no further. This espresso finish storage cabinet comes in eight tiers capable of holding up to 132 PlayStation games (or 114 Wii games), all in a sleek, narrow shelf that takes up as little space as possible. Even two of these, side by side, let you make the most of very little space, while offering double the storage capacity, if you feel you’ll need a bit more to hold all your games and other display items. The unit comes with three fixed levels, and five you can adjust for height to suit your needs, whether you wish to store your movies and games in the same place or want to keep a few decorative pieces to add more of a personal touch. In search of a heavy-duty shelf that’ll hold and let you organize your expansive collection, without the fuss of purchasing multiple units? This is the storage unit for you. These double width storage racks have a central divider bisecting 14, adjustable shelves that you can tweak to suit your preferences, as well as organize your games in the order best suited to your needs. 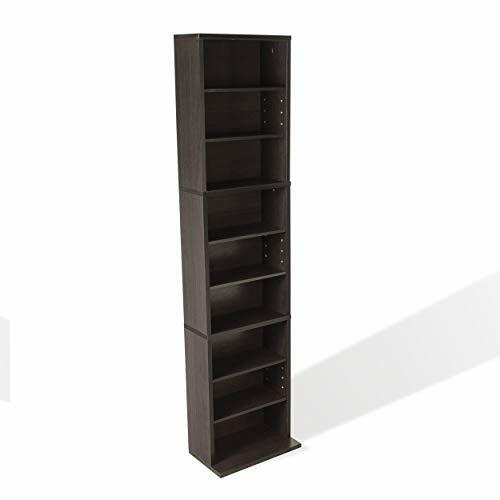 Available in cherry, oak or plain black laminated composite wood, this unit has the classic feel of robust storage shelves you would find dominating a wall in your study or library, and can be used not only for multimedia but also books and other display items. Altogether, the rack can hold up to 480 PlayStation game cases, or 270 Wii games. Whether you’re looking to group all your Resident Evil games in chronological order, want to separate games by genre or simply arrange them in order of personal favorites, the ideal storage unit makes this job easier for you. Rather than a standard bookshelf or readily available cupboard, media units which are specifically made to house multimedia cases are recommended, especially if they come with handy little organizational features such as adjustable shelves. These you can shift around depending on your storage needs, so you don’t wind up wasting any of the available space. Shelves or racks which come with in-built or adjustable dividers are also handy for those of us a bit finicky about how we organize our games – these features let us sort out display items based on our personal categorizing requirements, and help to multipurpose by letting us use the same space to hold other items, like photographs and keepsakes. Opting for laminate constructed shelves is also a life-hack you might find handy. While authentic, wood-based storage units lend a lot more rustic charm to your furniture, such pieces are also likely to be more expensive, as well as more difficult to maintain over time. With laminate, essentially made of pressed wood, you get better durability, with scratch-proof surfaces that damage less easily and are simpler to clean up and maintain. Alternatives to laminate include rod-iron or steel structures, which also offer durability and resistance to wear. Whenever it comes to storage, the space that the storage unit takes up is also important. If you are looking to make the best of your available space, especially if you wish to keep these racks in your bedroom or basement, we recommend opting for firm-based structures that maximize on height rather than width. Narrower shelves with multiple, adjustable tiers let you save horizontal space, while making the most of vertical wall space to let you store more items.